Sometimes it seems that different sectors of the economy out of synch with each other. The energy industry has gone down the tubes (although indications are that a recovery is in progress) and the building industry in Tulsa is booming. Looking out a window at work there are three different projects going on. The closest one is a new hotel going up. There are several hotels going up downtown now. And then if you follow the street alongside the hotel you can see that they are extending the street to the high rise on the right. That is our former city hall that has been converted to a hotel. Part of the deal with the hotel to meet code is that they needed a street going to it because the city likes hotels to have two streets for firetrucks and such to use. It is a pretty expensive road project because it is on top of a parking garage. And then just this side and to the right of the hotel is on lazy $50 million renovation of our Central Library. From what I can tell they are going to store most of the books off site and put in lots more computers. I’m sorry but I think what they are doing is turning our library into an internet cafe for the homeless, methheads, and K2 addicts. Also, the library’s director hornswaggled the board of the library into giving him a paid four month leave of absence to get his PhD. The guy makes over $170,000 per year plus a $450 a month car allowance, plus, plus, plus. He makes more than the Governor of Oklahoma! Do you really need a library director who is gone for four months? Poor use of taxpayer funds I think. Oops, I digress, what is happening where you live? 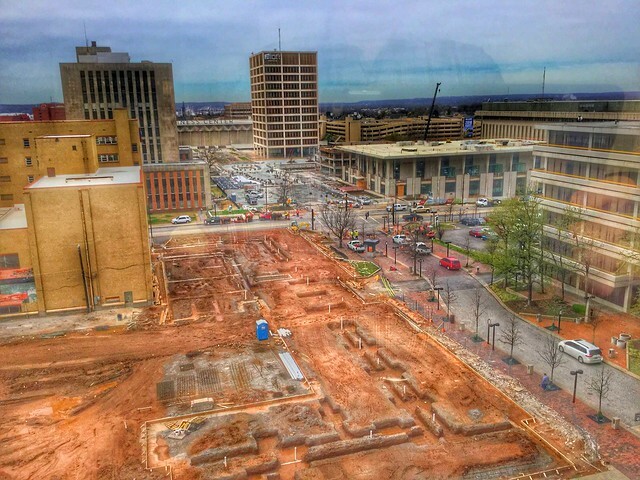 This entry was posted in Tulsa and tagged Construction, Downtown Tulsa, Hotels, Oklahoma, Tulsa, Tulsa Libraries on March 26, 2016 by Alan Bates.